Each plant appearing in this gallery is used as a representative for the whole group of plants to which it belongs. Clicking on one of the landscape plant pictures below will bring you to information about others that are similar to it -- and information about how to use them in the yard. 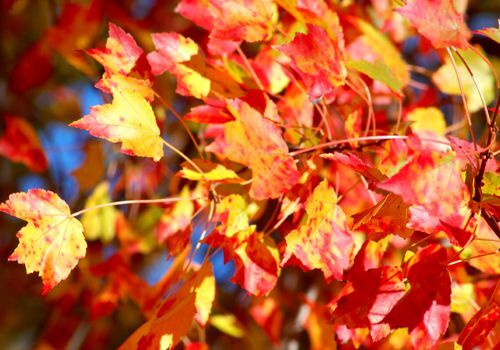 The photo of the red maple tree, for example, serves as an "index" to the various types of fall foliage trees that I cover; click it to visit my resources on that subject. Maple trees are, of course, the fall foliage trees par excellence. Flowering trees, such as the weeping higan cherry shown in this picture, light up the spring landscape. I offer more pictures of flowering trees ​elsewhere. But as browsing in my resources on flowering trees will reveal, some flowering trees make major landscaping contributions during other seasons of the year, too. In the North, evergreen trees are an indispensable part of the winter landscape. If you live in eastern North America, you may take sumac shrubs for granted, because they grow wild there. But take an objective look at sumac shrubs this fall, and ask yourself the question, "What other shrubs have fall foliage to match this?" I know what my answer would be: "Other than burning bush shrubs, not many!" For those in eastern North America who wish to avoid planting burning bush shrubs -- because they are alien invasive plants -- sumac shrubs may be your best option. Sumac shrubs are somewhat invasive, too; but at least they're native. The bluebeard shrub shown in this picture is a late-bloomer. Bluebeard (common name for the sub-shrub, Caryopteris) begins to put out blooms in late summer and continues to bloom into autumn. The blooms of bluebeard attract butterflies and bees. Other flowering shrubs furnish outstanding fall foliage and/or bear berries that attract wild birds. Of course, many flowering shrubs are best known for the beauty they bring to the spring landscape, such as that erstwhile harbinger of spring, the forsythia shrub. Evergreen shrubs are divided into two categories, needle-bearing evergreens, and broadleaf evergreens. Non-gardeners usually think only of the needle-bearing types when they hear the word, "evergreen," such as the shrubs often used in foundation plantings and in hedges. But gardeners are well aware of the contributions to the landscape made by the broadleaf types, which include such mainstays as holly (see picture above) and rhododendrons (the latter is not only an evergreen shrub, but also a flowering shrub). The vines are perhaps the most versatile category of landscape plants. Some vines climb and are used for such purposes as covering arbors and disguising chain-link fences. Others, because they crawl on their bellies, also fall into the "ground cover" category (see next picture). Some are prized mainly for their flowers (as is the wisteria vine in the picture above), while others for their foliage (such as vinca vines, although vinca, too, produces a flower). Ground covers are often thought of as serving a particular practical function, primarily. For instance, ground covers may be installed in an area specifically to control erosion there, or suppress weeds. But sometimes, you get a bonus with ground covers: they can provide beauty, too. In spring, creeping phlox plants produce small flowers in dense clusters. If massed together, creeping phlox plants make and other flowering ground covers a powerful visual statement. The picture below shows "Moonbeam" coreopsis. A popular perennial for sunny areas in a yard, Moonbeam coreopsis plants bear daisy-like flowers and can take quite a bit of heat. There are other perennial plants that don't care much for direct sun. But that's okay with gardeners because a good shade plant can sometimes be harder to find than a sun-loving variety. For an example of a perennial plant grown in shade gardens, see my article on bleeding hearts. You plant a bulb in the ground and, months later, greenery springs up from your buried treasure. Such is the magic of this category of plants. Spring flowering bulbs include one of the earliest flowers to show itself in Northern gardens, the snowdrops. But while talk of "bulb plants" most readily calls to mind such early spring flowering bulbs (daffodils and tulips are other examples), not all bulb plants flower so early. For instance, Stella de Oro daylilies bloom in late spring and well into summer. Annuals are somewhat despised by "serious gardeners," who prefer perennials. But if you're landscaping for "curb appeal," for instance, there may be a place in your plantings for annuals. Annuals provide color for long stretches of time, and they do so immediately: that is, most people buy annuals from nurseries and garden centers, where they are typically sold in-bloom. Ornamental grass is one of the best examples of a low-maintenance plant. Perhaps you associate the word, "herbs," with cooking. You can enjoy the beauty of tropical plants in your landscape even if you live in a region with cold winters. It's just a bit more work, that's all! Elephant ears (see photo above), for instance, is a tuberous bulb plant grown as a foliage plant. Northern gardeners can dig up the bulbs before winter arrives and store them away till spring. Alternatively, treat them as if they were annuals and replace them each year. Not all plants are necessarily desirable; you may also want some help in identifying plants to eradicate (or avoid) while doing yard work. To that end, in my gallery of weed pictures I offer photos of such undesirables as poison ivy and poison sumac. But I also include pictures of the leaves, seed heads, etc. of common lawn and garden weeds. And before eradicating these, you might want to consider the famous definition of the great American philosopher, Ralph Waldo Emerson: "What is a weed? A plant whose virtues have not yet been discovered..." [Emerson, Fortune of the Republic, 1878, p.3]. Of course, "virtue" is subjective, so you'll have to make the decision yourself for any given weed. But some authors even argue that there is a purpose for weeds. Follow any of my links above to access additional resources for help in making your own decisions on weeds.